One of the most spectacular destinations in all of the Bahamas, Half Moon Cay is a privately owned island held by the Holland America cruise line. It is situated approximately 100 miles south of the city of Nassau and is accessible only by one of the cruise ships making stops throughout the Bahamas. Holland America proudly operates these cruises in partnership with private companies licensed to operate businesses on the island, and promotes these vacations to those who want to get away from the hustle and bustle of the major communities. 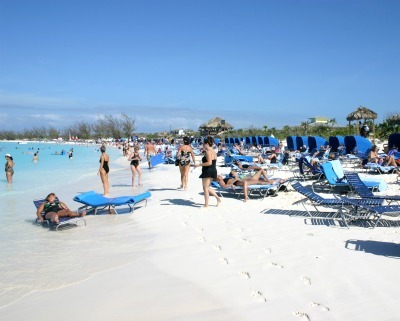 Half Moon Cay is truly a getaway spot, where one can imagine being king or queen of his or her own personal paradise. Half Moon Cay is largely natural area, with few docks and piers. The cruise ship anchors in the bay and all passengers are ferried ashore by small tender vessels, bringing visitors directly to the beach area and docking at modern arrival piers on the waterfront. The tourist shops and souvenir stores are located on this section of beach, where there is also a large restaurant and areas where organized recreation is overseen. Over 90 percent of Little San Salvador Island (another name for Half Moon Cay), which has a total land area of only 2.8 square miles, is unspoiled and totally natural. The entire island is a wild bird preserve and beach strolling while enjoying the many avian species is a favorite activity. Holland America operates many recreational activities as well, and visitors to the island can rent a catamaran, sailboat, view board or traditional surfboard while visiting. The beach recreation facilities include a volleyball and tennis court, basketball court, shuffleboard area, fitness trail and exercise stations. Several hiking trails lead from the activities center to various parts of the island, and for the more adventurous, jet skis and snorkeling equipment can be rented. The bay itself is well-protected from strong ocean currents, making Half Moon Cay very family-friendly in terms of swimming and relaxing on inflatable rafts. The Stingray Adventure Program offers guided tours for swimmers and snorkelers and is operated by experts that bring the world of undersea life up close and personal with tourists. The souvenir shop is simple but complete with locally made items such as straw hats, belts, sunglasses, sandals and photography supplies. The beach restaurant at Half Moon Cay offers cruise visitors an exciting blend of international cuisine, with the large Food Pavilion organized in cafeteria style. There are a number of open air dining shelters. Fresh fruit, buffet-style menu and a full service bar make for an enjoyable lunch or dinner while visiting the island. There is a complete restroom facility, shower station and changing room area located at the Food Pavilion. Because of its small size, the Half Moon Cay area is basically for foot travel. The island has no highways or long surface roads and all of the activities take place at or depart from the main docking areas. Long walks on the beach or strolls along the hiking trails are the only transportation needed in this beautiful, tiny paradise. Most purchases can be billed to the passenger account aboard ship, so using currency while on the island is unnecessary. The operators of the shops and recreational facilities at Half Moon Cay speak English as well as several European languages. The island is promoted as a getaway vacation, so there are no hotels, Internet cafes or other city conveniences. Passengers can make emergency international calls from aboard ship if necessary. 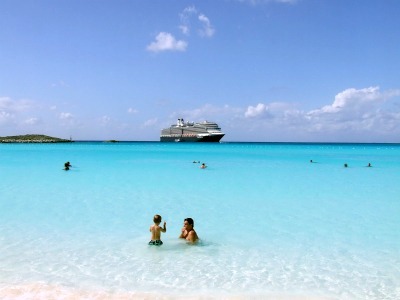 Half Moon Cay is a place to relax and forget about the outside world. A beautiful scene from the Half Moon Cay beach. 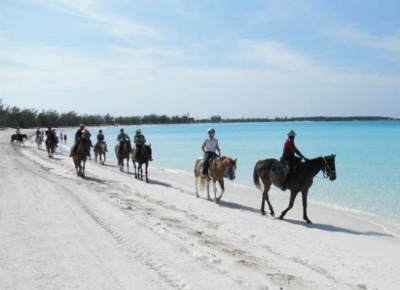 Horseback riding is a popular activity on this beautiful Bahamas island. 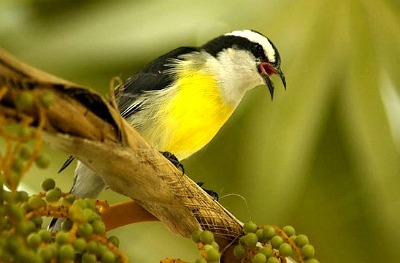 Since the island is wild bird preserve, you'll notice many interesting birds while walking on the beach. Cruise passengers are relaxing and having a great time on the beach.